Sherman Go! is designed for schools, workshops, training sessions and team building events. 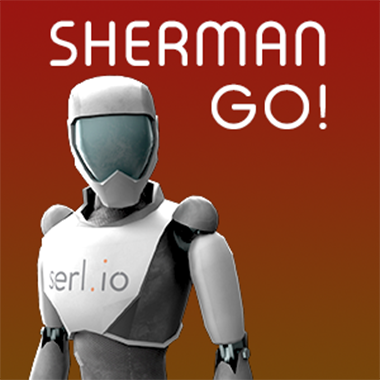 Your primary task is to get Sherman the robot through a multi-level 3D map to the star. But it is not that simple. As a team, you will need to develop and program a set of movement commands for Sherman to maneuver and avoid pitfalls while finding a way to the star. You will also need to achieve this using as few step counts as possible while working within a time limit. With different game modes and progressive levels, this experience will immerse and test your team’s ability to work effectively together in a truly unique and engaging way. Cultivate collaboration & communication skills. Apply time management and team organization skills. Sherman enters through a hatch on the table. Players are briefed on game objectives (dependiing on game mode) and instructions on how to interact using the HoloLens with an opportunity to familiarize with the gestures. A 3D multi-tier map is revealed including the basic movement commands. Players program Sherman by dragging commands to build a sequence of moves to get Sherman to the objective. Team score is recorded as the team progresses through different levels. Our team arrives about 1 hour before scheduled start to set up. Players will be given a 5 minute brief on how to put on and use the Hololens and an outline of the Sherman Go! Mixed Reality experience. Players will be seperated into groups (depending on size of class). Teams will be allowed to restrategize and re-attempt Sherman Go! (option) to observe improvements in results. A debrief is conducted at the end of the sessions. This include a leaderboard to see how each team performed. Sherman Go! is designed to work as part of an event, workshop or class. This is an indoor experience. A table at least 36″ x 36″ will be required for each group with at least 48″ of unencumbered space around the table for players to move around safely. Power outlets and a desk will be required for the facilitator’s station.